For the task of Pitch Repair Overseeding, a simple mixture of two amenity ryegrass varieties can be used as and when necessary on any hard wearing sports ground or playing surface that may be damaged, worn or thinning due to repeated play. This quick to establish amenity ryegrass blend is the best and most reliable formula for over-seeding in and around damaged areas of an entire sports field, particularly the goal mouth, touch lines and center line plus outlying spectator areas. 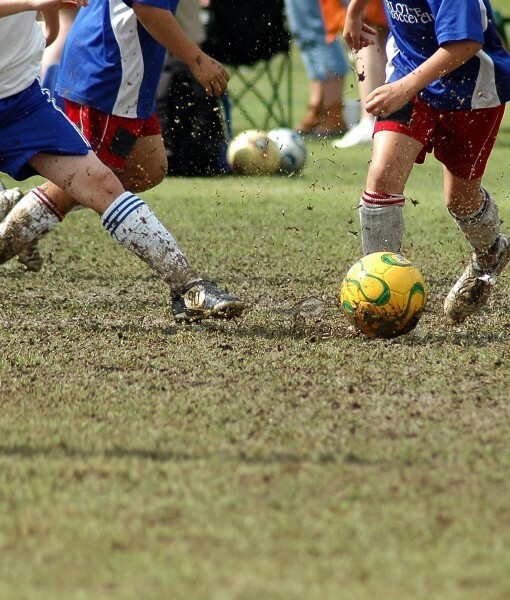 Pitch Repair grass seeds may even be applied to the training ground as part of an autumn, spring or on-going maintenance program. If a problem area continues to persist then it may be worth investigating further to see if an underlying cause is apparent. Vigorously rake, scarify or harrow the entire area to be seeded. This action should expose at least some soil required as a seedbed. If the surface cannot be exposed then a thin top dressing of 50% sand, 50% topsoil may be applied as a false seedbed..
Broadcast the seeds at the recommended rate over the entire area. Gently rake over the area to ensure the seeds are in contact with the seedbed then firm down with the back of the rake, by using a light roller or by lightly treading over. This not only puts the grass seed into good contact with soil moisture but also anchors the seeds into position preventing them from floating away during heavy/persistent rainfall. Grass seeds may also be simply surface sown however, germination may be uneven and significantly slower, particularly during periods of prolonged sunny, dry or windy weather – even with regular irrigation.